UTComp’s UltraAnalytix system for fiberglass reinforced plastic (FRP) inspection is discussed in an article, Non-intrusive FRP Inspection for Avoiding Premature Asset Retirement, published in the November/December 2017 issue of Inspectioneering Journal. The article, by UTComp president & CEO Geoff Clarkson, provides a case study of an actual inspection and evaluation of an FRP column. The client used a retired asset so that the non-destructive and non-intrusive results could be verified by destructive testing. 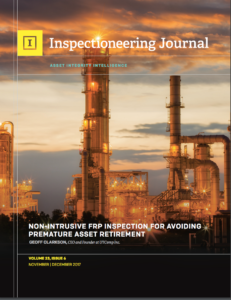 Read Non-intrusive FRP Inspection for Avoiding Premature Asset Retirement (pdf) and stay tuned for more information about UltraAnalytix inspection and performance to come in future issues of Inspectioneering.